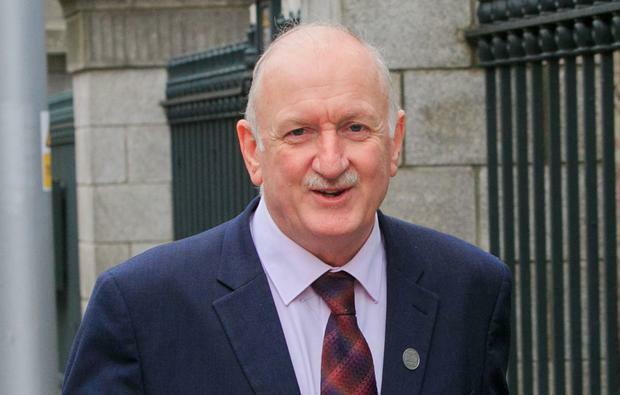 Dublin's Lord Mayor Nial Ring has managed to save his home from a bank sale after raising more than €1m to pay off debts he owes Bank Of Ireland Mortgage Bank, the Circuit Civil Court heard yesterday. Barrister Kate Conneely told the court that the three-mortgage debt owed by Mr Ring and his wife, who was also named in proceedings, which amounted to €903,420, could now be struck out by both parties' consent, as well as the bank's undisclosed legal costs. Funds capable of meeting all the outstanding debt owed to bank were now ready to be transferred to Bank of Ireland Mortgage Bank, and had been lodged with Mr Ring's solicitors, the barrister added. But there was mystery over the source of Mr Ring's million-euro financial boost, as Ms Conneely - appearing with Business and Commercial Solicitors - told Judge Jacqueline Linnane that the extent of the money, as well as where and how it had been raised, could not be divulged on the basis it may breach data protection legislation. Eithne Corry, counsel for the bank, confirmed that the bank accepted it was to be put in funds for settlement of outstanding debts and the bank's costs which, it had been suggested, could be measured by Judge Linnane. The judge said that on May 24, 2017, she had made an order for possession of the Ring family home at St Lawrence Road, Clontarf, Dublin 3. The Civil Bill had outlined three loans for €234,000, €380,000 and €486,000 (totalling €1.1m) with a stay on her order for six months on the basis that €10,000 a month would be paid off for the duration of the stay. It was part of her order that on default of any €10,000 payment, the stay would be automatically lifted. The judge said her order had been appealed and had come before the High Court on March 15, 2018. The appeal had been withdrawn and a consent order had been made again on grounds of a stay of 11 months on the basis that €10,000 a month would be paid over that period, again with a stipulation that the stay would be lifted in default of a single monthly payment. The Rings had then obtained a High Court ex parte injunction restraining the sheriff from acting on behalf of the bank. The Rings had given the bank an undertaking as to damages which, Judge Linnane said, she thought would not be worth very much bearing in mind the extent of their outstanding debts, which included mortgage arrears of €527,000. When Judge Linnane suggested postponing any order to strike out the proceedings until the funds had been transferred from the Rings' solicitor's account, both parties asked for a brief adjournment to facilitate talks. Shortly afterwards the court was told the funds had been transferred to the bank but confirmation of the transfer may take a day. Judge Linnane put the matter in for mention again on Monday and was told there would be no need for the court to measure the bank's legal costs. Mr and Mrs Ring did not have to attend court for mention of the settlement and will not have to attend on Monday.